During the biannual XXII International Mass Spectrometry Conference in Florence, Italy, our Founder&CEO dr. Janssen presented a lecture on MS-PECD in a session on Chiral Discrimination. As the previous editions, IMSC 2018 covered all aspects of Mass Spectrometry, from fundamentals to instrumentation and applications. The conference was organized with short courses, tutorial lectures, oral and poster sessions, workshops, awards, commercial exhibition, social program and companies user meetings. In particular there were sessions on Life Sciences, Instrumentation and Methods, Food and Beverage, Fundamental Mass Spectrometry, and Organic & Inorganic MS. Some 1600 participants attended and presented more than 200 lectures and 1000 posters. For a detailed program see the conference Program here (pdf). The complete and published Book of Abstracts of IMSC2018 can be downloaded here (pdf link). The conference was organized by the International Mass Spectrometry Foundation and during the meeting the Thomson Award 2018 and the Nico Nibbering travel fellowships were awarded. We are very pleased that in June 2018 we received a grant from the iPro-N / Interreg-Europe program, managed by OOST NL, for the development of a `high repetition-rate fast time-resolved spatial imaging chiral detection system`. The novel detection system will be part of a prototype analytical Mass Spectrometry (MS) tool, currently under development at our company, to enable direct MS of complex chiral molecular samples by MS-PECD. Interreg-Europe helps regional and local governments across Europe to develop and deliver better policy. By creating an environment and opportunities for sharing solutions, they aim to ensure that government investment, innovation and implementation efforts all lead to integrated and sustainable impact for people and place. OOST NL is an agency that focuses its activities and projects on strengthening and stimulating the economy of the provinces of Gelderland and Overijssel, the Netherlands. OOST NL assists international companies with business location, expansion and relocation services. More information about the iPro-N program can be found at this link: www-ipro-n.eu. More information about Interreg-Europe can be found at this link: www.interregeurope.eu. We are very pleased to inform you that dr. Arno Vredenborg has joined us as Chief Technology Officer and will start effectively as of September 2018. Dr. Vredenborg did his Masters and PhD studies at LaserLaB VU University Amsterdam and defended his PhD thesis on Coincidence electron and ion imaging of femtosecond laser induced dynamics in atoms and molecules on 2 November 2009. After Post-doctoral studies from 2009-2011 at Roentdek Handels GmbH and Goethe University Frankfurt, he joined Philips Research in Eindhoven in April 2011, where he worked on various projects related to semiconductor lasers (VCSELs) and medical in vitro diagnostic devices (IVDs) for industrialization. He joined the optics group in 2013 to work on new optical concepts for outdoor illumination. In the first half of 2016 he worked as a development engineer for Philips Lumec in Montreal, Canada. In the Fall of 2016 dr. Vredenborg returned to the High Tech Campus of Philips Lighting in Eindhoven, where he continued research, product design and software development on illumination optics for outdoor applications. Dr. Vredenborg has now joined dr. Janssen to further develop the technology and the applications of laser-based MS-PECD for direct Mass Spectrometry of multi-component chiral molecules. During the two-day international conference Forum for Analytical Science and Technology (29-30 May 2018 in Veldhoven, the Netherlands) a group of six students and MassSpecpecD BV won the COAST Community Challenge Award 2018 for the `most significant and innovative research proposal aiming at solving a COAST participant's Analytical Challenge`. The winning ("Sweaty") student team: from left Iris Groeneveld (MSc student University of Amsterdam / VU University and MSc+), Nienke van Dongen (MSc student Wageningen University & Research and MSc+), Fleur van Beek (PhD student in the MANIAC project at UvA), Ruben Kers (MSc student UvA/VU and MSc+), and Leon Niezen (MSc student UvA/VU); not present on the picture and 6th member of the winning student team is Rianne van Outersterp (MSc student UvA/VU and MSc+). In the middle Maurice Janssen (MassSpecpecD BV) and on the right Professor Peter Schoenmakers (University of Amsterdam), chairman of the FAST-2018 conference and board member of the public-private Analytical Science Consortium COAST (www.ti-coast.com). As part of the COAST Challenge Award 2018, the student team will work the coming year on the implementation proposed by the winning students as a solution for the challenge submitted to the FAST-2018 competition by MassSpecpecD BV on 'how to hyphenate GC and LC with the MS-PECD chiral mass spectrometry technology'. The hyphenation-project aims to broaden the application area of the multi-component chiral MS technology that is currently under development by MassSpecpecD BV. The FAST-2018 conference in Veldhoven focused on Analytical Science and Technology and the application areas in which this discipline plays a significant role. In various sessions, renowned experts from industry and academia shared their most recent results and accomplishments. The larger part of the program was based on abstracts submitted by industrial experts and young scientists from academia. Parallel lecture sessions were dedicated to specific application areas including Life Sciences, Chemistry, Energy, Materials, Food, Water, and High-Tech. The full 2-day program can be accessed here (Program FAST-2018) and the book of abstracts can be accessed here (Book-of-Abstracts-FAST-2018). The FAST conference is the 2-day annual forum for all novel and innovative analytical science and technology that is performed by the COAST participants, regardless of whether this is done in the framework of a COAST project or not. The public-private Analytical Sciences consortium COAST aims to advance Dutch excellence in its top sectors by providing pivotal analytical knowledge and instruments based on fundamental science, and by ensuring transfer of analytical expertise between application areas. COAST aims to achieve this by securing and improving Dutch expertise in analytical science and technologies. Further information on the public-private consortium COAST can be found here: www.ti-coast-com. Our Founder&CEO dr. Maurice Janssen gave a public evening lecture on MS-PECD at the Chemical Circle Den Bosch. 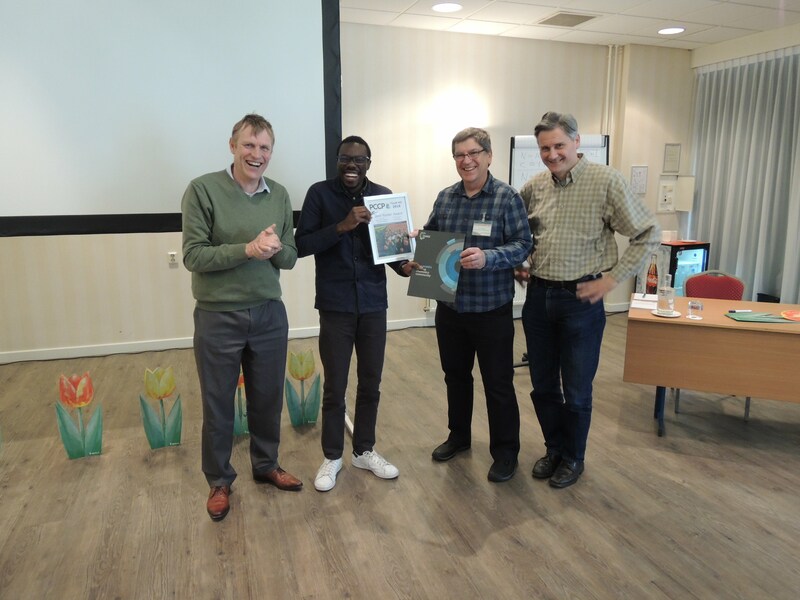 The lecture (1.5 hours) was attended by an enthusiastic audience of former and present professionals in chemical and life sciences in the wider region around the historic town of Den Bosch in the southern part of the Netherlands. The Chemical Circle Den Bosch was (re)founded in 1954 and is one of six circles that are part of the Royal Netherlands Chemical Society (KNCV). The circles are responsible for organizing informal activities across the country for chemists and other interested parties, such as lectures on current topics and excursions. Founded in 1903, the KNCV is the professional association of chemists, life scientists and process technologists in the Netherlands. The KNCV is the largest chemical professional association in the Netherlands. The member base consists of people with a shared passion for molecules and includes chemists, life scientists, process technologists and (bio-)molecular scientists. The 8,500 members, who work hard to bring the variety and richness of the molecular field to life, operate in business, education and government or study at universities or institutions of higher education in Netherlands. For more information on the Royal Netherlands Chemical Society (KNCV) see here www.kncv.nl. The city's official name 's-Hertogenbosch is a contraction of the Dutch des Hertogen bosch—"the Duke's forest". The duke in question was Duke Henry I of Brabant, whose family had owned a large estate at nearby Orthen for at least four centuries. He founded a new town located on some forested dunes in the middle of a marsh. At age 26, he granted 's-Hertogenbosch city rights and the corresponding trade privileges in 1185. During the annual Participants Council of the COAST Institute for Analytical Sciences (13 December 2017 in the Beurs van Berlage, Amsterdam) our company MassSpecpecD BV joined this Public-Private Community of Innovation for the Analytical Sciences. COAST's mission is to strengthen analytical science in the Netherlands by uniting R&D, human capital and infrastructure. COAST aims to advance Dutch excellence in its topsectors by providing pivotal analytical knowledge and instruments based on fundamental science and by ensuring transfer of analytical expertise between application areas. COAST plans to achieve this by securing and improving Dutch expertise in analytical science and technologies. MassSpecpecD BV will develop partnerships within the COAST community, both with Private and Academic partners, to further develop the novel technology of Mass-Selective PhotoElectron Circular Dichroism (MS-PECD) and to validate novel analytical applications of MS-PECD technology in the field of Food, Flavor and Fragrances; Pharmaceutical R&D; Agrochemicals; Volatile Organic Biomarkers in Medical Diagnostics. MassSpecpecD BV will also open up its R&D Laboratory for direct MS of chiral mixtures to interested users. The MS-PECD lab is embedded in the Institute for Molecules and Materials at the Radboud University, Nijmegen. For more information on COAST see the website here: www.ti-coast.com. Dr. Maurice Janssen (left), Prof. Ivan Powis (middle) and Prof. David Parker (right) in the MS-PECD laboratory at the Institute for Molecules and Materials, Radboud University Nijmegen, NL (7 November 2017). On 7th November 2017 our Founder and CEO dr. Maurice Janssen presented a colloquium on MS-PECD at the Institute for Molecules and Materials (IMM) of the Sciences Faculty of the Radboud University Nijmegen. Since the spring of 2017 the MS-PECD laboratory, that was formerly in the academic group of our CEO at LaserLaB Vrije Universiteit Amsterdam, is located and embedded within the Molecular and Laser Physics group of prof. David Parker at IMM in Nijmegen. Here the R&D on laser-based MS-PECD will be continued in the direction of fundamental studies of multi-component chiral mixtures, as well as in more applied analytical directions of chiral molecules in Pharmaceutical and Medicinal Sciences, Food and Fragrances, Pesticides and the role of chiral chemicals in the bio-ecosphere. Prof. Ivan Powis, University of Nottingham, one of the founders of the field of PhotoElectronChiralDichroism and special advisor of our company MassSpecpecD BV, was present during the lecture in Nijmegen for further discussions and a collaborative research project executed at the University of Amsterdam (dr. Wim Roeterdink and prof. Wybren Jan Buma) and Nijmegen, within the LaserLabEurope access program. From left to right: Ayse Duran, Hassan Ganjitabar, prof. Ivan Powis, prof. Wybren Jan Buma, dr. Wim Roeterdink and Dhirendra Singh in the laser laboratory for Molecular Photonics at the van 't Hoff Institute for Molecular Sciences at University of Amstedam for a collaborative MS-PECD project within the LaserLabEurope access program (9 Nov 2017). Our Founder & CEO dr. Maurice Janssen presented a lecture on MS-PECD at the First International Conference on Soft Chemical Ionisation Mass Spectrometry and Applications to Trace Gas Analysis. The conference was chaired by Prof. Chris Mayhew (University of Innsbruck / Birmingham) and Prof. Karl Unterkofler (FH Voralberg Dornbirn). The need for quantitative and rapid detection of chemical compounds in complex environments and at ultralow concentrations provides significant challenges to analytical chemistry for applications in many areas. Soft chemical ionisation mass spectrometric techniques can be used to address some of these challenges, and hence are key technologies for many analytical applications, ranging from atmospheric chemistry through to homeland security. The aim of this conference was to provide a forum for discussions on research, instrumentation and applications of soft chemical ionisation mass spectrometric (SCIMS) techniques, with a particular focus on the technologies of PTR-MS, IMS, IMS/MS and SIFT-MS, covering many of areas of applications, but with an emphasis on fundamental research and development, atmospheric chemistry, homeland security, and the environmental, food and health sciences. In the May 2017 issue of the journal 'Current Trends in Mass Spectrometry' a review on the current status of MS-PECD, authored by our Founder&CEO Maurice H.M. Janssen and our advisor Prof. Ivan Powis, is presented. The peer-reviewed paper presents an introduction to the novel MS-PECD technique for the direct Mass Spectrometric analysis of chiral molecules in complex mixtures and the quantitative measurement of enantiomeric excess. The paper reviews the latest developments of the (MS)-PECD technique till the beginning of 2017. The journal 'Current Trends in Mass Spectrometry' is published by Chromatographyonline.com which is the premier global resource for unbiased, peer-reviewed technical information on the field of chromatography and the separation sciences. Combining all of the resources from the regional editions (LCGC North America, LCGC Europe, and LCGC Asia-Pacific) of the award winning magazines, they deliver practical, nuts-and-bolts information to help the audience of scientists and lab managers become more proficient in the use of chromatographic techniques and instrumentation, thereby making laboratories more productive and businesses around the world more successful. The paper can be found at this link.